Microsoft has remained in the news for the past one year for aggressively pushing Windows 10 to Windows 7 and 8 users. What started in July as a routine upgrade notification, turned into something that saw many users go through automatic Windows 10 upgrades without their consent. This year, the company turned the heat up by first allegedly removing the close “X” button, and then halting some TV transmissions with the automatic upgrades. The process could be ignored or avoided, but people had little or no knowledge of how to disable these “recommended” updates without having to disrupt the routine and critical security updates. Seems like we are going to see some welcoming changes in the upgrade process this week. Only yesterday, we reported that Microsoft is paying out $10,000 to a woman in Seattle who claimed that after automatic Windows 10 installation, her workstation kept crashing resulting in losses for her small business. In the report, we quoted Wes Miller, a former Microsoft employee who said that the company shouldn’t risk losing consumer trust for the sake of having 1 billion devices running on Windows 10 – a goal it set while launching the new operating system last July. This is a first for Microsoft, and many users would definitely appreciate it. But, this isn’t an unexpected change in the upgrade process. We had already assumed that this would be happening once the company ends the free upgrade offer in July. After July 29, Windows 10 will cost you $119 and many hoped that Microsoft will also get some sanity back once it starts getting paid for the OS. Over 300 million machines are already running on Windows 10. After the Anniversary Update, the operating system is expected to get even more stable, fluid and feature-rich. That, and millions of enterprise computers that are to yet be upgraded, Microsoft might just meet its goal by 2017. But, is this ambition of 1 billion Windows 10 devices worth losing the consumer trust over? No one thinks so. We are providing the following official statement to be attributed to Terry Myerson, executive vice president, Windows and Devices Group: Our most important priority for Windows 10 is for everyone to love Windows. Since we introduced a new upgrade experience for Windows 10, we’ve received feedback that some of our valued customers found it confusing. We’ve been working hard to incorporate their feedback and this week, we’ll roll out a new upgrade experience with clear options to upgrade now, schedule a time, or decline the free offer. The ‘Red X’ at the top corner of the dialogue box will now simply dismiss the reminder and will not initiate the upgrade. We’ll continue to be led by your feedback and always, earning and maintaining your trust is our commitment and priority. 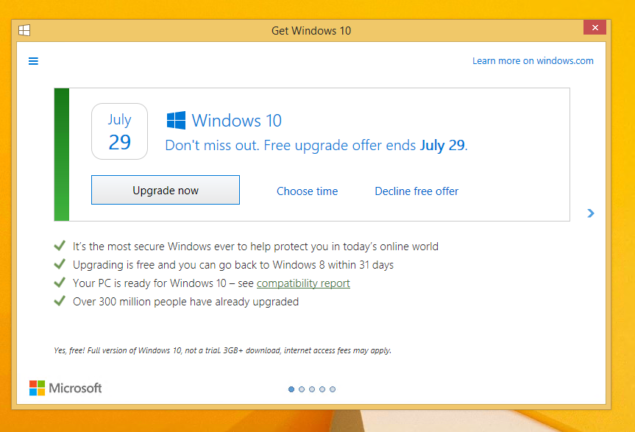 We recommend people upgrade to Windows 10 as it’s the most secure version of Windows and take advantage of the free upgrade offer before it ends on July 29.